Village signs is a series of caches based on the ornate signs that depict the heritage, history and culture of the villages that put them up (normally on the village green). 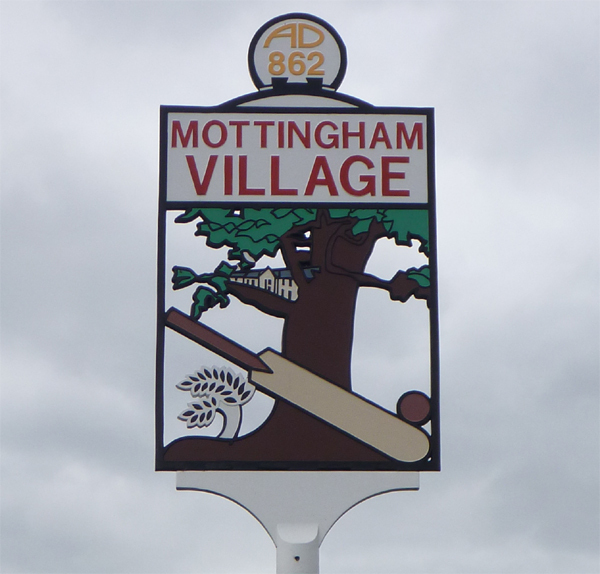 Mottingham has at least two identical Village Signs, one by the Methodist Church and this one near the War Memorial. Mottingham was first mentioned in records from 862 AD when it was recorded as Modingahema, - the land of Moda's people, commonly interpreted as "the proud place". Mottingham was originally a hamlet in Eltham parish, in the Blackheath hundred of Kent. In 1840 it was included in the Metropolitan Police District by the Metropolitan Police Act 1839. In 1866 the area became connected to the railway system with the construction of Mottingham station (then known as Eltham station). Also in 1866, Mottingham received separate civil parish status, thus separating itself from Eltham. In 1881 the parish had a population of 779 and covered an area of 642 acres (2.60 km2). When the County of London was created in 1889, Mottingham was excluded from the new county and now formed a protrusion of Kent, bordering London to the west, north and east. From 1894 to 1934 it formed a detached part of the Bromley Rural District and had its own parish council. In 1931 the parish had a population of 2,120. In 1934 the rural district and the Mottingham civil parish were abolished and the area was transferred to Chislehurst and Sidcup Urban District. In 1965 the urban district was abolished and the area was transferred from Kent to Greater London, to form part of the London Borough of Bromley. A local landmark is Eltham College, a private school founded in 1842 as the London Missionary Society's School for the Sons of Missionaries, which moved to its present site in Mottingham in 1912. The famous cricketer, Dr W. G. Grace lived in retirement for some years in Mottingham, until his death in 1915.